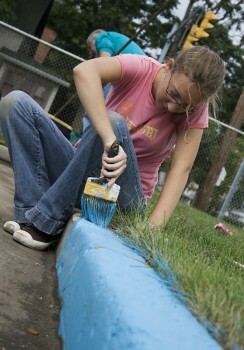 Hannah Miller spent Celebrate Service Day volunteering at Chandler Elementary School. Photo by Emily Miller. The faulty forecast for rain was no deterrent for a large participatory showing at Celebrate Service Day yesterday. Around 550 students, faculty and staff participated in the event this year, scattered among 40 different local organizations. 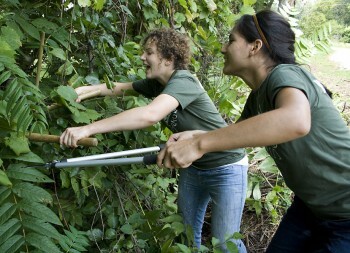 Celebrate Service Day is a way for the college to give back to the community by providing large quantities of able-bodied young adults for temporary hire at various local organizations. 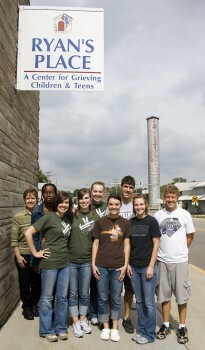 These organizations adhere to one or more of Goshen’s core values. A group of friends living on the first floor of the Senior Apartments helped organize books, make pamphlets and clean out a storage shed at Ryan's Place. Photo by Emily Miller. Tamara Shantz, assistant campus pastor and director of Celebrate Service Day, is excited about the number of organizations that were assisted this year.“We volunteer with local schools, Boys and Girls’ Clubs, Habitat for Humanity, LaCasa and MDC Goldenrod, among many others,” said Shantz. After a long day of hacking at roots and trimming bushes along the forest trails of Bonneville Mill Park with the Elkhart County Parks maintenance crew, senior Arienne Johnson reflected on her day of service. Tim Blaum, a senior, designed this year’s service day Tshirts and proceeds will go towards Habitat for Humanity. Emily Bowman (left) and Hannah Canaviri, along with the other sophomores on Yoder 3, helped Goshen Parks and Recreation prune back trees at the Rieth Interpretive Center. Photo by Emily Miller.